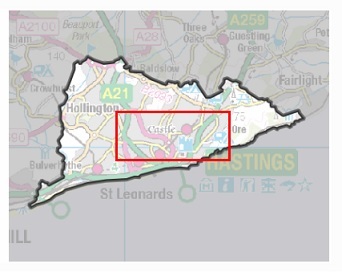 In order to use this Interactive version of the Hastings Borough Council LDF to its fullest potential it is strongly recommended that the user reads this guide before proceeding. 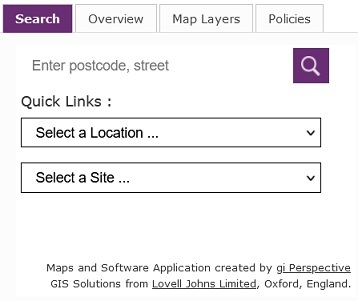 The maps can be accessed by clicking on the Maps link on the header bar. 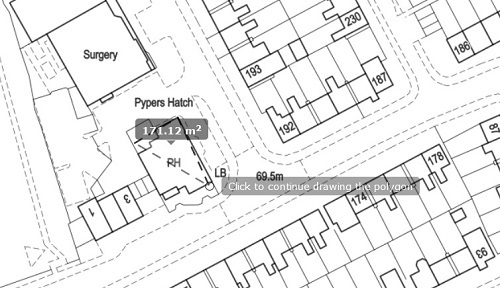 The main site consists of a map on the right hand side and on the left the following tabs. 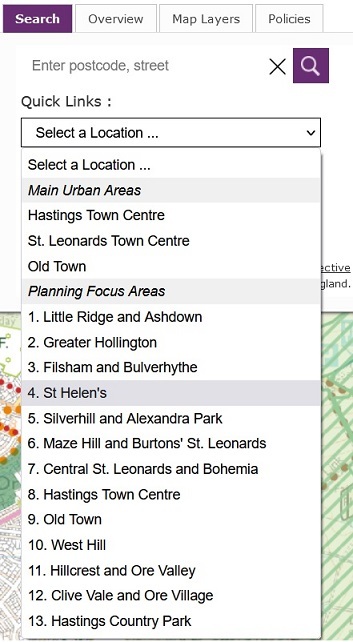 The mapping comprises 7 levels of zoom ranging from a simple borough overview to detailed OS MasterMap data. The current viewing level is indicated by the zoom level indicator and along with this the current map viewing scale is also displayed. Click on the desired compass direction (N, S, E, W) to pan the map in this direction. Select the Pan tool to be able to pan the map by clicking and dragging the map. Click on the Zoom in or Zoom out icons. Drag the zoom level indicator zoom to this level of detail. Double click on the map to zoom in at the clicked point. Select the Zoom tool and drag a zoom extent over the map. Key in a desired map scale and pressing the refresh button. Enter the postcode/street name or part of in the box and press go. The search will return with a list of the first 20 matches from which the user can click on the link to zoom to that part of the mapping. An example is shown below. 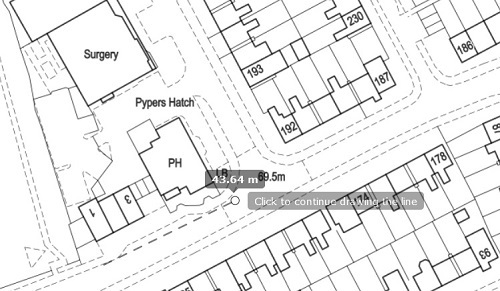 Or, if an exact match has been found, the mapping will navigate to this location directly. 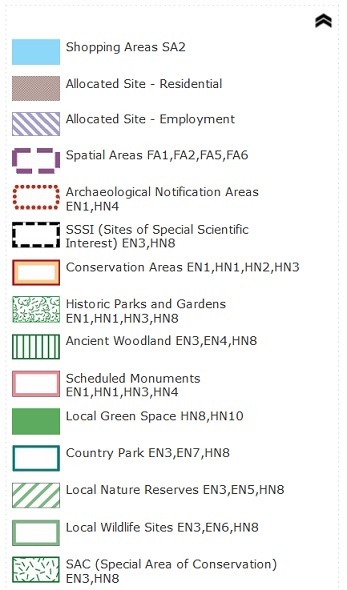 To navigate to a specific locality in the borough use the quick links. This contains a list of major localities in the borough in which the user can quickly navigate to. 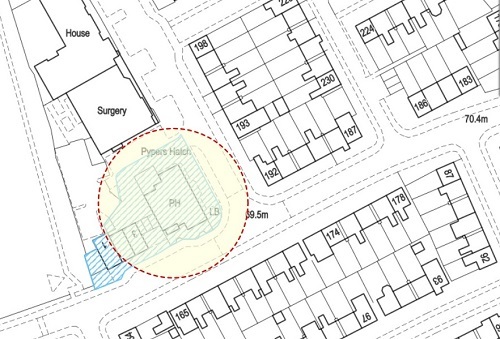 The key control provides functionality to control what policies are visible over the base mapping. 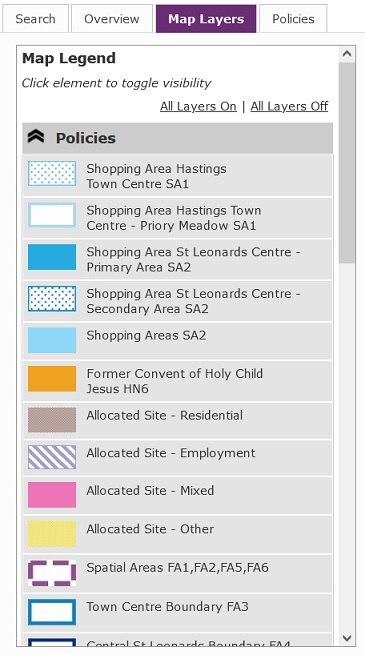 Each individual layer control doubles as a key to indicate how this policy layer is displayed on the map. To turn all layers on click on the All Layers On link. To turn all layers off click on the All Layers Off link. To turn an individual layer on/off click on the check box next to the layer. To turn a group of layers on/off click on the check box next to the layer group heading. To expand/collapse a layer group click on the "+" and "-" symbols. Clicking the symbol while holding down the shift key will expand/collapse all layer groups. 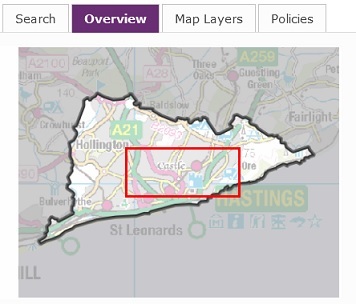 Please note that the interactive map allows policy boundary information to be displayed above the native scale at which they are shown on the source mapping. 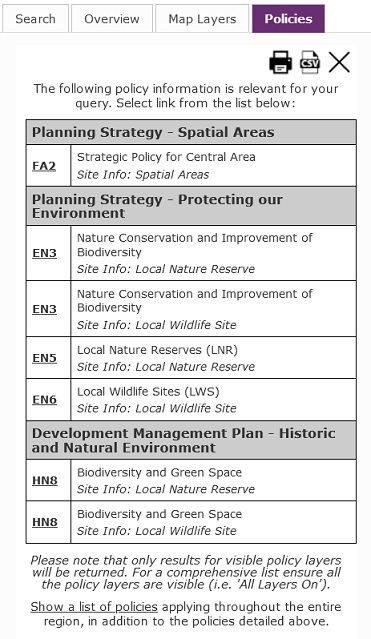 The site is able to query the map and return a list of policies associated with that query, as shown below. By clicking on each individual policy link, the user is able to view text information from the Written Statement pertaining to this policy. 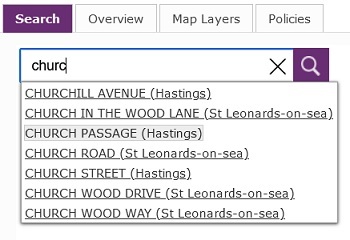 Note, that only the policies that are visible on the map will be used in the queries. So for a comprehensive query ensure all the policy layes are visible. Click on the Print button to open the list of captured policies in a new window ready for printing. Click on the Export button to save the list of captured policies as a CSV file. Click on the map and a list of all policies associated with this point location will be displayed under the Policies tab on the left. Use the Next and Previous links at the bottom to move between the results pages if necessary. To draw a polygon or line click on the map to define each shape vertex. To complete drawing double click. To define a radius or extent click and hold down the mouse on the map, then drag out to draw the radius or extent. Release the mouse button to finish drawing. 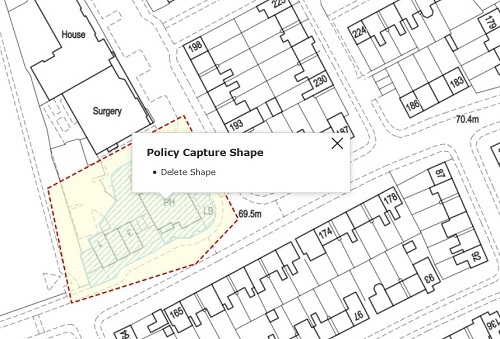 An example of capturing policies by a radius is shown below. When the shape has been drawn a list of all policies that intersect with this shape will be displayed under the Policies tab on the left. Click on the link to view the Written Statement text for this policy. When using these capture policy tools the capture shape will remain over the mapping until another query is performed. To delete click on the shape and choose the Delete Shape option, as shown below. Click on the "visible in the current view" link as shown below to list all the policies that are visible in the current map view. Click on the required link to view the Written Statement text for this policy. 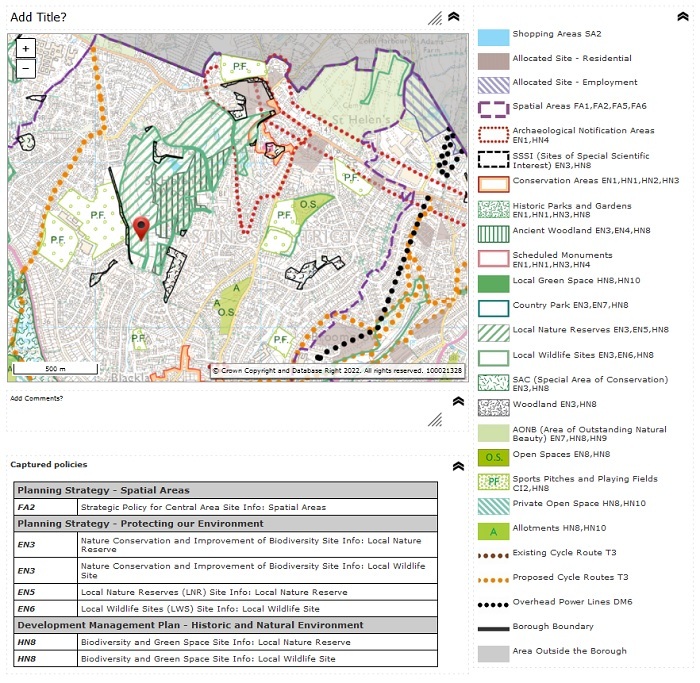 Once the user moves away from the current view, by either panning or zooming the map, the list of policy results will be cleared ready for the next query. The site provides fuctionality for the user to print the map along with a map legend and specific user information. Select the print button on the toolbar This will open the print layout page in a new window, as shown below. To add a custom title, replace "Add Title?" with the required text. If a title is not required this element can be hidden by clicking the hide button in the top right. To add a custom comments, replace "Add Comments?" with the required text. If no comments are necessary this element can be hidden by clicking the hide button in the top right. Mark out the line over the map by clicking once to add a vertex and double clicking to complete the line. The distance will display in the top right corner of the map. Mark out the polygon shape over the map by clicking once to add a vertex and double clicking to complete the shape. The area will display in the top right corner of the map. To save the map in JPEG format, click the Save Map button. The user will be prompted to either open the file or save it. Choose Save and define the location on the local machine to download it to.